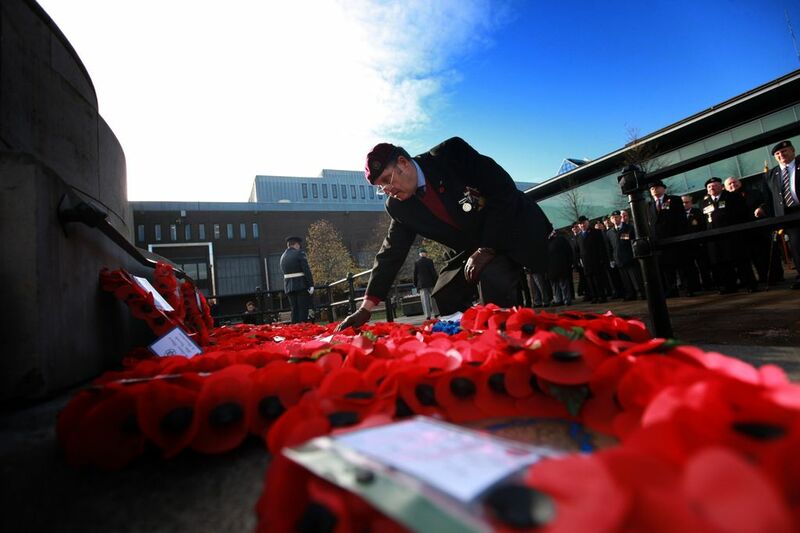 Wreaths were laid across the region as the North East remembered its fallen heroes. Crowds gathered around war memorials to honour those who died in conflicts past and present on Remembrance Sunday. In Newcastle busy Eldon Square fell quiet as the two minute silence was observed. Amongst those paying their respects was Second World War veteran Fred Jewett, who recently received Russia’s highest honour for his bravery whilst serving on the dangerous Arctic Convoys that transported vital military supplies to the country. Earlier this year he was also presented with the Arctic Star by Prime Minister David Cameron. Sixty-eight of the 811 ships to sail the route were sunk, and thousands of lives were lost. “Today I think about all the convoys that were lost during the war,” said Fred, 88, of Heddon-on-the-Wall. But I also like to remember the camaraderie that we all shared too. Former RAF warrant officer Alan Lowson, 81, of Durham, attended the service with wife Eileen. But it is at the First World War memorial The Response outside the city’s civic centre that they laid their wreath in memory of their son-in-law Major Jim Kingham who was killed during the Gulf War. Former Lance Corporal Derek Turnbull, 36, served with the Second Battalion Fusiliers and the 201 Northern Field Hospital. Mr Turnbull, from Newcastle, who now works as a healthcare assistant in accident and emergency said: “I make a point of coming every year and feel very strongly that the two minute silence should be observed. “I remember when I was a kid everything stopped, but today some people seem to think they are too busy. Wreaths were laid in ceremonies across the North East. From shoppers at the Metrocentre to folk at the coast in Whitley Bay and crowds in Bedlington and beyond, people stopped and paused to pay their respects. 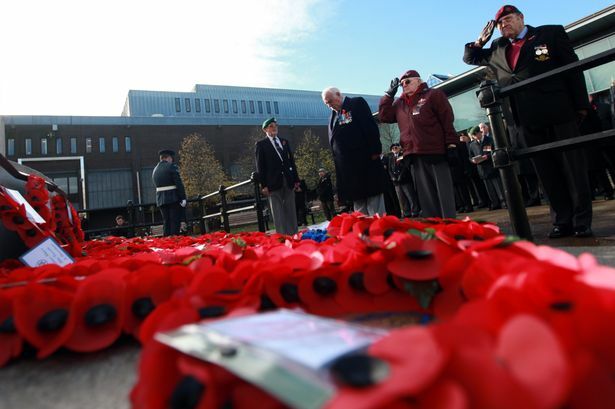 Silence fell across Britain as the nation united to honour its war dead on Remembrance Sunday. The Queen led the tributes and was joined by senior royals in central London. She laid the first wreath at the Cenotaph in memory of all those who have made the ultimate sacrifice, in what was the focal point of the day’s commemorative events. After laying her wreath, the Queen bowed her head, before Second World War veteran the Duke of Edinburgh, Prince Harry and the Duke of Cambridge stepped forward to lay their wreaths. Prince Harry laid a wreath on behalf of his father Prince Charles, who marked Remembrance Sunday by attending a service in India, where he is currently on an official tour with the Duchess of Cornwall. Other royals abroad included the Duke of York. He visited troops in Afghanistan with Defence Secretary Philip Hammond, and took part in a service at Camp Bastion. Millions joined in the two-minute silence that began as Big Ben struck 11am. Prime Minister David Cameron was first after the royals to lay a wreath, followed by Labour leader Ed Miliband and Deputy Prime Minister Nick Clegg. Former prime ministers Sir John Major, Tony Blair and Gordon Brown, and London Mayor Boris Johnson also took part in the ceremony. More than 10,000 veterans and civilians filed past the Cenotaph to pay their respects to their departed comrades, led this year by members of the War Widows Association.